I had only replaced the battery on my Pulsar 200NS motorcycle 3 months ago – just before I took it on a 2-month tour around SE Asia. My previous battery was about 2 years old and I didn’t want to risk a bad battery on the trip. But shortly after returning to Singapore, and while performing maintenance on the bike, I had absent-mindedly left the key in the ignition and in the ON position. That severely drained the battery and was left with less than 5V. After an eventful jumpstart, stalling the engine down the road, and a good samaritan assisting in “push starting” my bike using his own motorcycle and his leg, I managed to get to KL and back without incident. After the incident, I was very mindful to not leave my key in the ignition. I do not ride my bike daily – I drive mainly. And the last time I fired up the Pulsar 200NS was about 5 or 6 days ago. “Time to take her for a ride!” I thought. Inserted key and tried to turn on the bike. Nothing. No lights on the console. No sign of life. Absolutely nothing. Opened up the seat, whipped out my multimeter and measured the voltage. 4.12V??! But I was absolutely certain I did not leave the ignition turned on this time! The Yuasa YTX9-BS was manufactured in Mar’16 and installed on 20May16. The Yuasa YTX9-BS was only installed some 3 months ago. In fact, it was manufactured just less than 1/2 a year ago! It’s a VERY NEW battery! 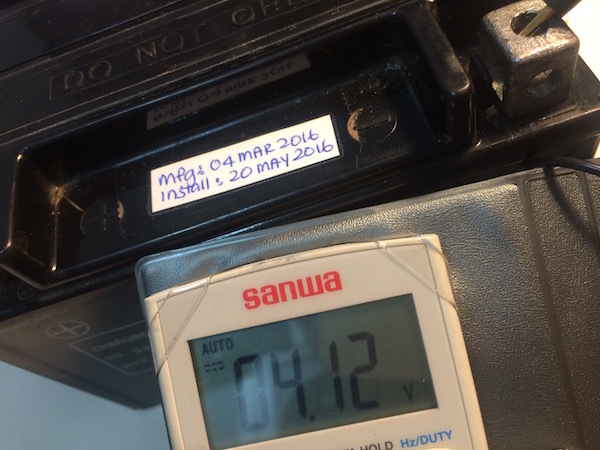 The electrical engineer in me did some online research, and confirmed my suspicion – lead acid batteries DO NOT like deep discharges. 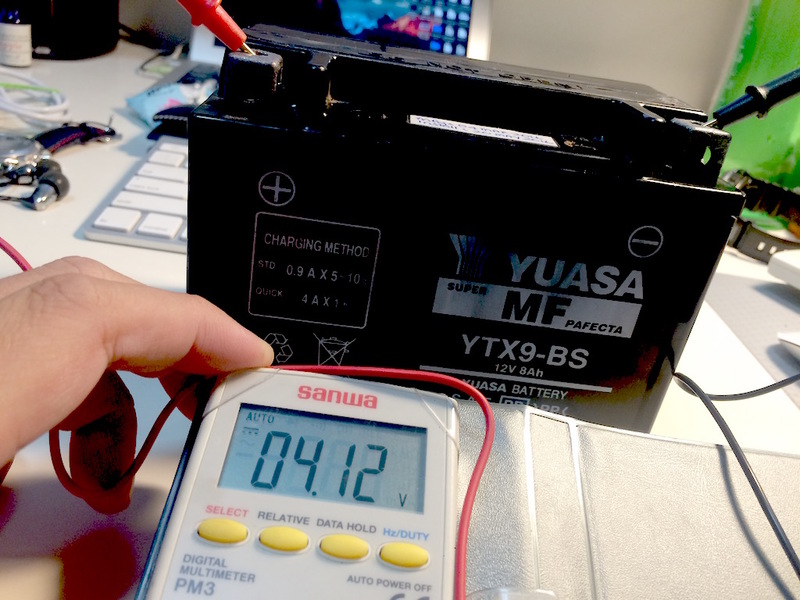 Discharging it to below 10.5V damages the battery. And NEVER discharge it to below 80% of it’s rated voltage (9.6V). Well, I guess at 4V previously, I have probably already permanently damaged the battery. So this time round, even though I was absolutely certain I had my ignition turned OFF, the injured battery couldn’t even hold 1 week of charge. Thankfully, I’ve kept my previous battery as spare. It was measuring some 11.4V. I swapped it around, and tried to fire up the bike. 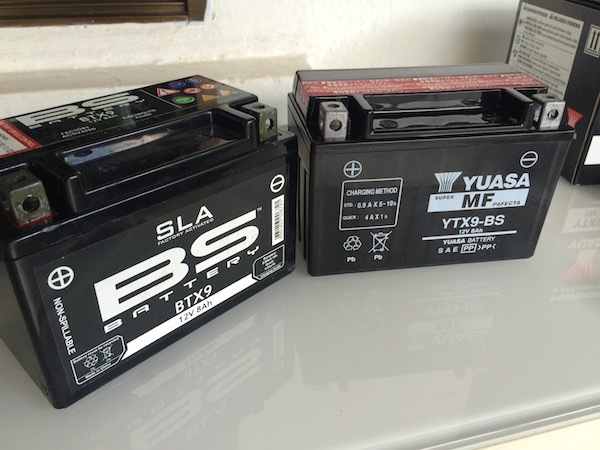 The old BS battery on the left gave me no BS even after sitting on the shelf un-utilised for 3 months! I guess I’ll keep the old one in the bike for now – until I get a new replacement battery. Update 25Aug16: I eventually bought a replacement Yuasa YTX9-BS from Lim Ah Boy for $55. Installed it in my Pulsar 200NS like the last time around. I just learnt that the Pulsar 200NS uses the same battery as the Honda CB400 Super 4. Most Super4’s use YTX9, but the Super4 Revo uses the slightly bigger YTZ10S (or the equivalent TTZ10). Thanks for the info. The only reason I’m mentioning it is so that in case I (or someone) else wants to get a new battery for the 200NS in the future, and if the batt shop guy doesn’t know which battery model fits the 200NS, mentioning the super popular Super4 may help. How about using lithium battery ? I’ve also read up on your post about the lithium ion batteries and after that I’m glad I haven’t put my money down for it yet. I’m using my bike just for daily commuting to work and the occasional outing that’s still within SG, so I guess getting the lithium ion would be an overkill. Anyways, just wanted to share my experiences and thoughts on this. I’ll stop now, I’m blabbing too much already.. Lol! Thanks for the experience share! Hope you got your battery issue sorted out! I just got myself a new battery. Plugged it in happily, turn ignition key on… Nothing. Dead silence. So now it seems that the issue might be more than just a dead battery. I’m starting to suspect that a fuse might have blown. Unfortunately for me, I don’t have a multimeter to test the circuits with. Thankfully though the guy I got the battery from is willing to help me test out. I mean, I just bought the battery from him brand new in the box. It’s also been only like 15mins since I got it from him and plugged it into my bike? Lol! (Batt had about 12.4V when he opened the box to test with me). You can likely check the fuses visually to see if you’ve blown it. Unless you’ve used it up previously, the bike comes with spare fuses. Next Next post: Lithium-Ion batteries in Motorcycles? ← Pirelli Angel CiTy tire review ← Lithium-Ion batteries in Motorcycles?